“Orange is the New Black” is one of the hottest shows around. When it comes to home design, however, it turns out that black is the new black. One of the hottest trends in the home improvement industry in 2014 is black fencing. That’s right; you heard it here first. Black fencing! So why is black fencing the new “it” accessory for the backyard? In one word: contrast! When paired with a lush landscape, a black fence can really help your flowers, bushes, and other vegetation pop. Just imagine those beautiful pink tulips against a black backdrop. Amazing! Those bright yellow sunflowers look even brighter in front of a black fence. Wow! Even greens look more brilliant against the dark background. Beautiful! Your neighbors, guests, and random passersby will all marvel at the added curb appeal your new black fence has to offer. Curb appeal. A new black fence will help give your home a boost in the curb appeal department. Privacy. A fence will help improve the privacy of your yard. Home value. A new fence, no matter the color, will help boost the value of your home. 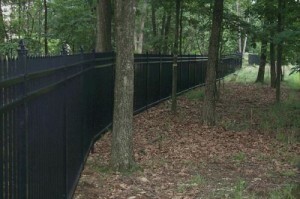 If you dare to be different, contact Hercules Fence today and ask about our many black fencing options! We are more than happy to help you choose a fence that not only meets your style and functionality needs, but also your budget. As Virginia’s largest fencing company, Hercules Fence knows a thing or two about fences. This unique distinction also allows us to buy our fencing products at a price that will afford you value to complement our quality. That’s what we like to call a win-win! If you have any questions about Black Fence Installation, please contact Hercules Fence, the largest residential fence company in Northern Virginia, by calling (703) 551-2609 or visiting our website. Also, check out Hercules Fence of Manassas on Facebook, Twitter, Google+ and YouTube! This entry was posted on Wednesday, June 11th, 2014 at 4:04 pm. Both comments and pings are currently closed.